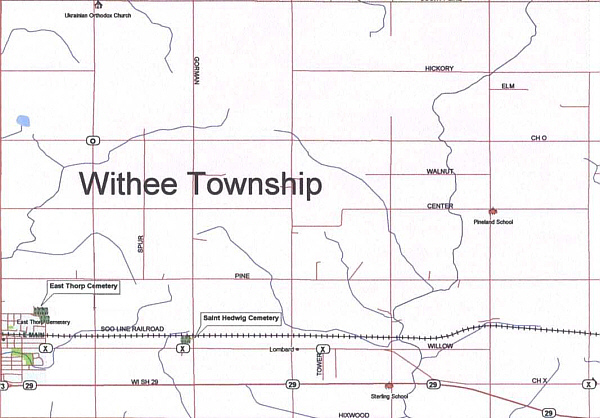 The Township of Withee was originally a part of the township of Hixon, which was organized by an act of the Wisconsin legislature in 1873.In 1880, the township of Withee was formed. The known first white settler in the area was James Seneca Boardman who came in 1870. In 1871, D. R. Goodwin and George Richards moved into the present town of Withee. In 1872, James Boardman built a shanty in the southeast quarter of section 30. This area later grew to become the village of Thorp. In 1880, the Wisconsin and Minnesota Railroad (formerly the Wisconsin Central) began construction. At this time, there were three homes in the village of Thorp. A center of logging operations was the sawmill at Sterling, situated on the railroad about 4 miles east of the present city of Thorp. At Lombard, about a mile west of Sterling, there was a railroad siding, and a small community was located there at one time. In the late 1880s, when the big scale logging operations were drawing to a close around the saw mill located at Sterling (four miles east of the present city of Thorp), the Polish land agents Felix I. Piotrowicz and E. I. Slupecki from Milwaukee, began selling 40-acre plots of land in the area to Polish and Lithuanian immigrants. Originally they were to create a settlement called Poznan (Posen) near Sterling. 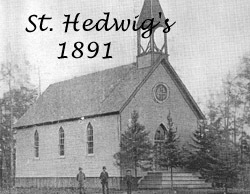 In order to entice immigrants to settle, they donated land for and assisted in building the original St. Hedwig's church. However, the settlers later decided on a site for the church two miles west of the proposed village of Poznan. 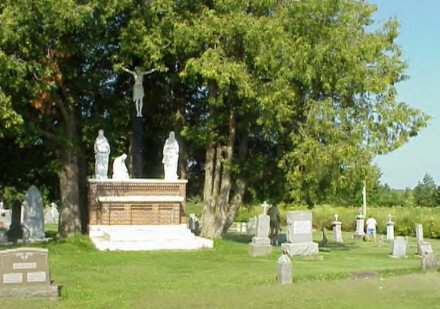 Because of this influx of Polish and Lithuanian settlers in the late 1800s, the township of Withee was, at one time, occupied predominantly by people of Polish and Lithuanian descent. To this day there is a strong sense of Polish culture in the area. Thorp - See the Thorp web page- The City of Thorp straddles the border between the towns of Thorp and Withee. **This Clark Co., WI Internet Library, ALHN & AHGP website is dedicated to the free sharing of information by researchers, local historians, genealogists and educators. Because of our non-profit status, submissions are not to be used for profiteering of any kind. Our representatives cannot accept gratuities beyond the basic expenses (i.e. postage, copying, courthouse or rental fees) for obtaining requested information. We reserve the right to ban the involvement of anyone who intentionally disregards these policies. Promotion of research services or publications is not permitted on these pages, or by our representatives without the prior endorsement of the site overseers. If you need professional help, we recommend contacting an accredited genealogist. 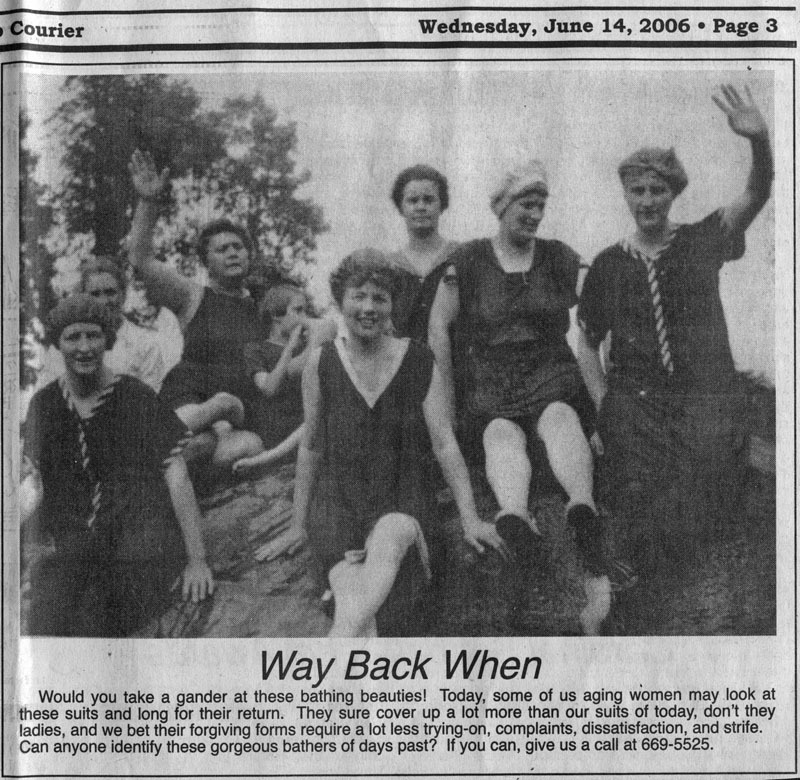 ; Please show your appreciation for this database by Becoming a Clark County History Buff or making a contribution to our Support Fund and Perpetual Preservation Account to help keep this Clark Co., WI database freely available on the World Wide Web and free from commercial enterprise. *** This copyrighted Clark Co., Wis. genealogy and history material is used on this nonprofit site with permission of the submitter. Contact us if you are personally aware of anyone using this submitted data inappropriately It may not be copied and posted on any commercial genealogy sites such as Family Tree Maker or the merged companies Ancestry.Com/RootsWeb/MyFamily or sold for personal profit. 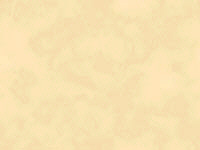 Every submission is protected by the Digital Millennium Copyright Act of 1998<.a>.